"Pincushions...can never have enough. I love this things. giggling and thinking at 78 I've loved a lot of them"
"Beautiful pattern. WOW!! And so easy to make. Thank you so much!!!" "How much is the Yoki the fat Dragon kit"
"An easier way to gather--zig zag over dental floss in the seam allowance. The dental floss will not break." "Ma Petite Mercerie scammed me and my products never arrived. Their uncooperative customer support wont return my money and says its not their fault that I didnt receive my order." These gorgeous Christmas hand embroidery patterns will turn your house into a home this winter. We are adding the pattern to your Sewing Patterns. The pattern was added to your Sewing Patterns. Click here to view your Sewing Patterns. Sometimes in the busyness leading up to Christmas, it can be hard to find time to sew unless you're super organized. It's much easier to have a little project that you can pick up and work on by hand for a few minutes. Unless you've been living under a rock for the past couple of years, it won't have escaped your notice that embroidery displayed in embroidery hoops and hand lettering are both a thing at the moment. This Vintage Christmas Wreath Beaded and Embroidered Ornaments project combines lettering, embroidery and hand sewing, so its perfect if you want a nice little thing to work on that's not over-ambitious. The hoops measure 3 inches (about 8 cm) across. I used 3 colors of embroidery thread and red seed beads, and they are worked on a cotton linen blend. If you don’t have the beads and you don’t want to buy some, you could sew some French knots in red or white instead. Fabric to sew the designs onto. I used 3 squares of a cotton linen blend. Each square was 5 inches x 5 inches (about 12 cm x 12 cm). Three embroidery stitches are used for this pattern: backstitch, lazy daisies, and French knots. They are all worked using 2 strands of embroidery thread. Find the tutorials for these three hand stitches after this section. First, you will learn how to design the ornament, then the stitches, and, finally, putting it all together. I’m going to show you how to draw them yourself, but if you don’t want to faff about with this, you can download the designs I used here. Draw round the inside of the embroidery hoop. This will ensure that your design will fit inside the hoop! 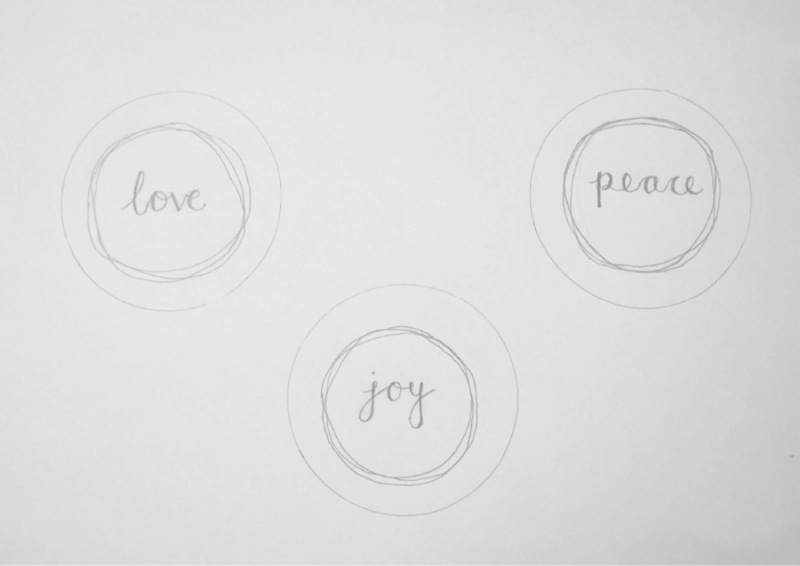 In a cursive style of handwriting, write the word "joy." On the downstrokes, add extra lines and color in the spaces. Around the letters, draw 3 rough circles. If you don’t like them, don’t worry, just erase it and have another go. Add some leaves. Don’t make them too small and be sure to space them out. It will look nicer and be easier to sew. Please note that my designs don’t have the leaves on! I decided that I’d rather just sew them and not be constrained by what I’d drawn. Repeat for the words "love" and "peace." If you wanted to, you could just write the words and use the garland you’ve already drawn. I redrew them because I wanted each hoop to look slightly different. Now transfer them to the fabric. You could either use dressmakers’ carbon paper, or you could trace them. If you want to trace them, it’s easiest to do this if you use a lightbox. You can make a lightbox yourself using a plastic box and your phone. 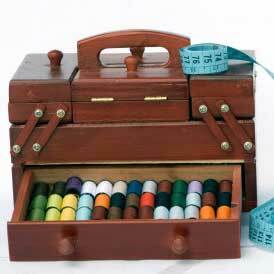 Bring the thread through to the right side at the start of where you want to begin sewing. Make a stitch by passing the needle through to the back. Now bring the needle through to the right side again. Make another stitch by passing the needle through from front to back at the end of the previous stitch. Now bring the needle back up on the right side, and make another stitch by sewing back to the end of the previous stitch. You’ll need to use small stitches for sewing curves, and longer ones where the lines of the design are straighter. Bring the needle through to the right side of the fabric. Make a loop by passing the needle back through to the back, next to where the loop starts. This will be the bottom of the stitch. Bring the needle back up to where you want the other end of the stitch to be. Catch the loop and pull it taut. Now sew over the loop. Bring the needle through to the right side. With the needle close to where the base of the knot will be, wrap the thread around the needle a couple of times. Pull it taut. Pass the needle through to the back, not in the same space though or you’ll lose your knot! Hold the knot with your thumb while you pull the thread through. The letters are worked in backstitch. I wrote each word without lifting the pencil off the page, so it’s possible to sew each word all in one go! Just start at one end and keep going, just as if you were writing. For the thicker downstrokes, go back and add an extra line of stitching. For the dot of the "j" in joy, sew a French knot. The garland is also sewn using the backstitch. Choose a point where all three lines intersect and start there. Go round once, following one of the lines. When you get back to where you started, go round again following another of the lines. Keep going until you have completed the garland. The leaves of the garland are worked in lazy daisies. Starting on the outside of the garland, sew lazy daisies at an angle so that they are all pointing in the same direction. Spread them out and don’t make them too small! When you’ve sewn leaves around the outside of the garland, sew some more on the inside. Don’t worry if you have to miss some leaves out for the letters. Once the embroidery is completed, sew seed beads to the garland. Pop the embroidery hoop you’ll be using to display the embroidery over the top of it and draw around it. Trim the fabric down to a couple of centimeters away from the circle you drew. Using the inside part of the hoop, draw round it onto a piece of felt and cut it out. Put the embroidery into the hoop for display. Sew a running stitch around the excess fabric at the back and pull it tight. Sew the felt to the back of the embroidery. Tie a piece of ribbon for hanging. Which festive words will you use for your ornaments? Free Template - How to Add a Pocket to Any Bag! "Personal Information" means information that is about any individual, or from which any individual is directly or indirectly identifiable. "Process", "Processing" or "Processed" means anything that is done with any Personal Information, whether or not by automated means, such as collection, recording, organization, structuring, storage, adaptation or alteration, retrieval, consultation, use, disclosure by transmission, dissemination or otherwise making available, alignment or combination, restriction, erasure or destruction. Personal details: your name; username or log in details; password; areas or topics of interest; information provided in response to quizzes or surveys or to use certain related programs; and photograph (if you or another user posts a photo on the Service). Demographic information: including but not limited to gender; age/date of birth; salutation; job title, company information, education, work experience and other professional information; and language preferences. Location information: location data that describes the precise geographic location of your device ("Precise Location Data"). Non-precise information about the approximate physical location (for example, at the city or zip code level) of a user's computer or device derived from the IP address of such computer or device ("GeoIP Data"). Device identification ("ID"), which is a distinctive number associated with a smartphone or similar handheld device, but is different than a hardware serial number. Advertising ID, which is a unique, user-resettable identification number for advertising associated with a device (e.g., iOS uses the Identifier for Advertising (or "IDFA") and Android uses Google Advertising ID). Internet Protocol ("IP") address, which is a unique string of numbers automatically assigned to your device whenever you access the Internet. Pixel Tags, also known as clear GIFs, beacons, spotlight tags or web bugs, which are a method for passing information from the user's computer to a third party website. Under certain circumstances and depending on applicable law, some of this Other Information may constitute Personal Information. Personal Information together with Other Information is hereinafter referred to as "User Information". Where we need to Process your Sensitive Personal Information for a legitimate purpose, we do so in accordance with applicable law. The Services are not intended for use by children. To the extent that information we collect is health data or another special category of personal data subject to GDPR, we ask for your explicit consent to process the data. We obtain this consent separately when you take actions leading to our obtaining the data, for example, when you sign up for a newsletter on our site or agree to allow us to track you. You can withdraw your consent at any time by unsubscribing from our newsletters as set out in Section 6 or adjusting your preferences as set out in Section 15. Children. The Services are not intended for use by children, especially those under 13. No one under the age of 13 should provide any Personal Information or use our public discussion areas, forums or chats. Minors under the age of 18 are not permitted to make purchases through the Services or obtaining coupons or codes from the Services to purchase goods or services on third party websites. If, notwithstanding these prohibitions, your children disclose information about themselves in our public discussion areas, consequences may occur that are not intended for children (for example, they may receive unsolicited messages from other parties). If it is discovered that we have collected Personal Information from someone under 13, we will delete that information immediately. We may collect or obtain User Information about you: directly from you (e.g., where you contact us); in the course of our relationship with you (e.g., if you make a purchase); when you make your Personal Information public (e.g., if you make a public post about us on social media); when you download, install, or use any of our Services; when you visit our Services; when you register to use any part of the Services; or when you interact with any third party content or advertising on the Services. We may also receive User Information about you from third parties (e.g., social network sites). We may also create User Information about you, such as records of your interactions with us. Prime Publishing is not responsible for Personal Information you volunteer about yourself in public areas of the Services. This Policy does not cover the practices of third parties who may provide information about you to Prime Publishing. Data you provide: We may obtain your Personal Information when you provide it to us across our Services (e.g., where you sign up for emails, newsletters or SMS messages; register for site membership or create a profile or account on any part of the Services; enter a sweepstakes, contest, competition or prize draw; participate in surveys and quizzes; perform search queries through the Services; contact us via email, telephone or by any other means; make a purchase; etc.). Third party information: We may collect or obtain your Personal Information from third parties who provide it to us. This may include offline channels such as through telephone or direct mail efforts; from customers, vendors, suppliers, third parties, commercially available or publicly-available sources (e.g., data brokers, data aggregators, public databases, etc. ); third party affiliate network operators; referral sources; and social network sites or services (e.g., Facebook, Twitter, LinkedIn, etc.). If you use a third party connection or log-in (e.g., Facebook Connect, Twitter, or Google+) to access the Services, create a membership or profile on any part of the Services, access our content or forward our content to another person, platform or service, we may also receive your username or email address for those third party services or other information available about you or collected from you on those services. Creation of User Information. We may also create User Information about you, such as records of your interactions with us and details of your purchase history, for internal administrative purposes and analysis. We may also use User Information you have provided to us with data obtained from third parties to enhance our records or enhance our ability to provide products and services, such as appending additional information to your profile. We may Process User Information for the following purposes: providing the Services to you; communicating with you; providing advertising to you on the Services and Channels; analyzing engagement with our audience; observing user engagement and purchase activity across the Service and Channels; offering lead generation services; marketing our services and offerings to current and prospective customers; managing our IT systems; financial management; conducting surveys and quizzes; ensuring the security of our systems; conducting investigations where necessary; compliance with applicable law; and improving our Services. Provision of the Services to You: providing the Services to you from Prime Publishing or its partners including (i) offering of contests, as well as chat areas, forums and communities, (ii) management of your account, and (iii) customer support and relationship management. Identification: using information from third parties to verify information about you in order to provide the Services (e.g. verify your mailing address to send you requested products or services. Surveys and Quizzes: engaging with you for the purposes of obtaining your views on our Services, as well as learning more about your interests, including your interest in third parties and their offerings. Research: analyzing, benchmarking and conducting research based on User Information and your interactions with the Services. Communications: communicating with you via any means (including via email, telephone, text message, social media, post or in person) regarding content and other information in which you may be interested, subject to ensuring that such communications are provided to you in compliance with applicable law; maintaining and updating your contact information where appropriate; and obtaining your prior, opt-in consent where required. We may provide direct marketing to you as set out in Section 6 below. Commerce Offerings: using cookies to track your browsing history and the amount of money spent at a particular third party merchant's site to offer coupons and other offers that are relevant to your shopping experience. Lead Generation: producing customer leads that are shared with third party advertisers through marketing campaigns, including but not limited to email marketing and site placements. Marketing to Customers: We may market to current and prospective customers and their employees who have indicated an interest in doing business with, or have previously conducted business with, Prime Publishing in order to further generate and promote our business. Such efforts include sending marketing emails or conducting phone calls to drive the purchase of advertising, marketing our lead generation, job boards, and other business services offered by Prime Publishing. IT Administration: administration of Prime Publishing's information technology systems; network and device administration; network and device security; implementing data security and information systems policies; compliance audits in relation to internal policies; identification and mitigation of fraudulent activity; and compliance with legal requirements. We may Process your User Information to contact you with information regarding services that may be of interest to you. You may unsubscribe for free at any time. We may Process your User Information to contact you via email, telephone, direct mail, or other methods of communication to provide you with information regarding the Services that may be of interest to you. We may send information to you regarding the Services, upcoming promotions and other information that may be of interest to you, using the contact details that you have provided to us and always in compliance with applicable law. You may unsubscribe from our newsletter lists at any time by following the unsubscribe instructions included in every email we send. We will not send you any emails from a list you have selected to be unsubscribed from, but we may continue to contact you to the extent necessary for the purposes of any other Services you have requested or for additional emails you have signed up for. Prime Publishing and/or certain third parties may collect information about you for online behavioral advertising purposes in order for you to receive relevant interest-based advertising on the Services and on other websites, platforms and media channels. We use Online Data as well as other User Information to send you online behavioral ads. Online Data is aggregated with the Other Information and data we collect and/or similar data collected by partners to create groups of users and certain general-interest categories or segments that we have inferred. We use this information to get a more accurate picture of audience interests in order to serve ads we believe are more relevant to your interests. Google's use of advertising cookies enables it and its partners to serve ads to your users based on their visit to your sites and/or other sites on the Internet. You can use Ads Settings to manage the Google ads you see and opt out of interest-based ads. Even if you opt out of interest-based ads, you may still see ads based on factors such as your general location derived from your IP address, your browser type and recent, previous searches related to your current search. Tracking technologies on the Services may be deployed by Prime Publishing and/or by our service providers or partners. Certain tracking technologies enable us to assign a unique identifier to you, and relate information about your use of the Services to other information about you, including your User Information. We may match information collected from you through different means or at different times and use such information along with offline and online information obtained from other sources (including from third parties), including, but not limited to, demographic information and updated contact information, for the purposes of learning more about you so we can provide you with relevant content and advertising. We and our partners (including but not limited to e-commerce partners, affiliates, and analytics providers) also may use technologies such as pixel tags, e-tags, IP addresses, Local Shared Objects, Local Storage, Flash cookies and HTML5 to analyze trends; administer the Services; collect and store information such as user settings, anonymous browser identifiers and video viewing history; supplement our server logs and other methods of traffic and response measurement; track users' location and movements around the Services; gather demographic information about our user base; and to improve our understanding of traffic on the Services, visitor behavior, and responses to promotional campaigns. We may receive reports based on the use of these technologies by these third party companies on an individual and aggregated basis. For example, we may connect information about your IP address to known corporate or User Information and use the associated information related to aggregate content preferences to assist in our efforts to market services to you or the originating corporation(s). Various browsers may offer their own management tools for removing Local Storage. To manage Flash Local Shared Objects please click here. Prime Publishing and/or certain third parties may collect information about you for online behavioral advertising ("OBA") purposes in order for you to receive relevant interest-based advertising on the Services and on other websites, platforms and media channels. OBA is also referred to as interest-based advertising. For a list of some of the applicable providers click here. For information about how to opt out of tracking methods for these entities and others, click here. For more details about OBA and opting out, see Section 15 below. By using our website you consent to us sharing a hashed, non-human readable version of your email with our partners who will drop a cookie on your browser and match your email with its marketing file to create a link between your browser and our partner's record of you; this link shall be shared by our partner globally for the purpose of improving the relevance of online advertising and content by third parties that are unaffiliated with our website. Our partners use this information to recognize you across different channels and platforms over time for advertising, analytics, attribution, and reporting purposes. Please click here to opt out of your data being used for these purposes. This link will direct you to our partner's opt-out centre. We may disclose your User Information to: legal and regulatory authorities; our external advisors; parties who Process User Information on our behalf ("Processors"); any party as necessary in connection with legal proceedings; any party as necessary for investigating, detecting or preventing criminal offences; any purchaser of our business; and any third party providers of advertising, plugins or content used on the Services. For some of our Services, we may make some information, such as the name of our users, their mailing address, phone number, email address—and in certain circumstances their employer's name, company size and other industry data—available on a rental or other basis (e.g., sale) to third party providers of goods and services, for example, when such information is provided in connection with certain content available on our websites. Depending on where you reside, when you register for certain Services, we may share the Personal Information you provide with certain advertisers and sponsors. With respect to surveys and quizzes, in the event that responses are publicly disclosed, users will be notified at the time they take the survey or quiz. Otherwise we will disclose only aggregate information regarding its users' responses in surveys or quizzes to other participants in the survey. Where surveys or quizzes allow users to submit written comments, and where Prime Publishing advises users of the possibility of such disclosure at the time they take the survey or quiz, Prime Publishing reserves the right to disclose any information provided by users, provided that no User Information identifying a specific user is disclosed. Prime Publishing and some of our advertisers may use third party advertising service companies to serve advertisements, for OBA or otherwise, and perform related services when you interact with the Services. Often, these third party advertising companies employ cookies and other technologies to measure the effectiveness of website, app and email advertisements and to create a record of interaction with our content that they use in conjunction with their advertising which appears on other sites or applications, or for reporting website traffic, app use, statistics, advertisement data and/or other activities on the Services. We also engage third party providers to assist with the segmentation of this data. We may also engage third parties for the purpose of recognizing our users and delivering interest-based content and advertisements to them. We may share your User Information with our partners such as your name, postal address, email, or other identifier. Our partners may also: (i) collect information directly from your device, such as your IP address, device ID, advertising ID, and information about your browser or operating system; (ii) combine User Information about you received from Prime Publishing with information about you from other sites or services; and (iii) place or recognize a unique cookie on your browser. We may transfer your Personal Information to recipients in other countries. Where we transfer User Information from the European Economic Area ("EEA") to a recipient outside the EEA that is not in an adequate jurisdiction, we do so on the basis of standard contractual clauses. Because of the international nature of our business, we may need to transfer your User Information within the Prime Publishing group of companies, and to third parties as noted in Section 9 above, in connection with the purposes set out in this Policy. For this reason, we may transfer your User Information to other countries that may have different laws and data protection compliance requirements to those that apply in the country in which you are located. We take every reasonable step to ensure that your User Information is only retained for as long as they are needed. 15. What Can I Do to Control My Information? Summary — What Can I Do to Control My Information? Your Newsletter and Email Subscriptions. You can opt out or unsubscribe from a newsletter or other email list at any time by following the instructions at the end of the newsletters or emails you receive. Please allow five to ten business days for changes to take effect. On some Services, member service-related communications are an integral part of such Services to which you subscribe and you may continue to receive emails as part of that particular portion of the Services unless you cancel your account, even if you opt out of the newsletters or email list. If you have provided more than one email address to us, you may continue to be contacted unless you request to unsubscribe each email address you have provided. Location Based Services. You may opt-out of having your Precise Location Data collected by Prime Publishing at any time by editing the appropriate setting on your mobile device (which is usually located in the Settings area of your device). OBA. Prime Publishing strives to adhere to the self-regulatory organization principles for the DAA (US), the DAAC (Canada) and the EDAA (EU). Online ads on the Services using Online Data are delivered with the DAA Ad Marker Icon , which helps users understand how their data is being used and provides choices for users who want more control. This icon is usually on each of our web pages and applications where Online Data is collected that will be used for OBA purposes. Cookies and Pixel Tags. You may stop or restrict cookies and pixel tags on your computer or purge cookies from your browser by adjusting your web browser preferences. However, if you "turn off," purge, or disable cookies or pixel tags, although you may still use the Services, you may not be able to use all of the features, functions, or services available on the Services. California Residents. In accordance with the California Online Privacy Protection Act, we may collect Personal Information about your online activities when you use the Services. While we give our users many avenues to opt out of providing Personal Information, we do not respond to Web browsers' "do not track" signals. California's "Shine the Light" law, Civil Code Section 1798.83, permits our users who are California residents to periodically request and obtain certain information about any Personal Information disclosed to third parties for direct marketing purposes. If you are a California resident and wish to make such a request or if you wish for us to refrain from gathering your Personal Information, please submit your request in writing to the contact details set out in Section 17 below. For more information concerning your use of the Prime Publishing website and application, please see our Terms of Service. Note: To unsubscribe from our e-mail newsletters instantly please visit us here. Our Data Protection Officer may be contacted at dpo@primecp.com.